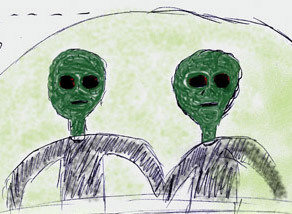 Dark avocado green, rough lizard-like skin around big, black eye holes of short, thin entities that wore skin-tight black garments inside a lime green glowing small craft in radio engineer's back yard, 1977, Southern California. Illustration © 2010 by Mr. Jones. Updated below with Texas Nurse comment: December 6, 2010 Southern California - On November 23-24, 2010, I broadcast one of my monthly three hours of news updates about science, environment and Real X-Files on the Premiere Radio Networks' program Coast to Coast AM with George Noory, 11 PM to 2 AM Pacific. That night I had an extraordinary firsthand interview with a Texas nurse who asked to remain anonymous, but who said she and her husband had encountered non-human entities at their Dallas home on August 19, 2010. Please see 112410 Earthfiles. Previous PostPrevious Beyond Carbon-Based Life Forms – How Different Could E. T. Be?